This is about as good as an episode of White Collar gets. Sure, there was the requisite hammy guest star (Neil Jackson as Federal Reserve-burglar Lawrence), occasional goofy one-liners from Mozzie (something about the Kardashian sisters and cargo space), and the usual straining of credibility (wouldn’t Neal have had to be a tad more meticulous to emulate the burnt edging when he faked the remaining evidence of his phony Chrysler painting?). But those are, mostly for the better, part of the show’s cartoon-y charm, its nod to the little flourishes that made stylish ancestry like Knight Rider and Miami Vice so cannily entertaining. But what really makes this season three premiere such an engaging return to form is that it pares things down significantly from where we’d left off. Season two, while having grown all of Collar’s central relationships and offered a pretty big payoff—for both viewers and Neal—spread the net distractingly wide and was forced to shuffle too many pieces around Andrew McCarthy’s scattered feature appearances. By contrast, “On Guard” eats up all of 10 minutes making it plain that Mozzie was behind the U-Boat art swap, Neal’s on board for the subsequent getaway plan, and Peter rightfully suspects that his supposedly reformed consultant friend is at least circumstantially connected to the theft. 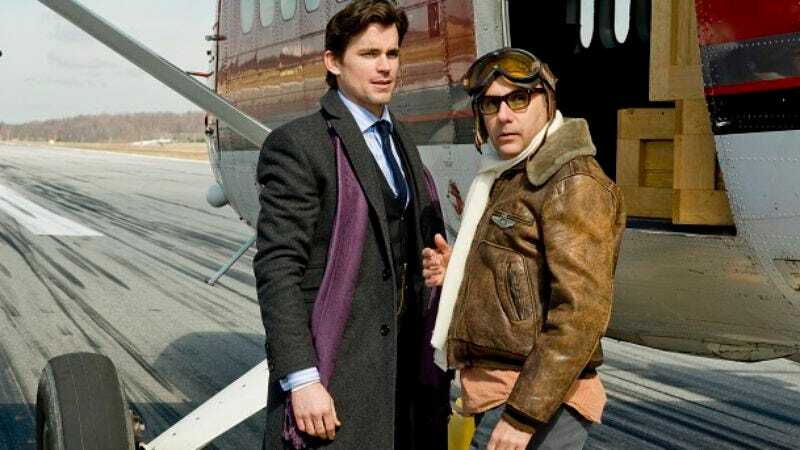 The rest, excepting two particularly absurd tête-à-têtes between Neal and Lawrence, who seeks out one of Caffrey’s old aliases to help him smuggle millions of dollars, boils down to where we all had a hunch the series might be headed: an unambiguous clash of wits and trust between Neal and Peter. Even Elizabeth, who’s usually relegated to being Peter’s ultimate confidant, asserts herself as a valuable asset to her husband’s down-low investigation, and their collaboration makes the couple’s chemistry feel more alive. The decision to bookend the episode with a climactic cops-and-robbers chase and direct the majority runtime in recent flashback feels a bit cheap at first but pays off with a very satisfying twist and an exciting narrative opening for the season as a whole. And it will be interesting to see how the producers work Neal’s relationship with Sara—and the fact that he was one botched white-collar bust away from leaving her without a trace—into the escalating drama. Either way, the schemers behind White Collar appear to have gotten the memo that, while its network welcomes more characters than Noah’s Ark, keeping their ensemble airtight and being unafraid to square Peter and Neal off against each other is what will keep this resurgent show on long enough to figure out where it goes next. “Picasso was a Communist, he’d be happy to share.” Mozz strikes again! So am I wrong by interpreting that, between Mozzie’s “idle hands” quip and the whole “Phoebe Cates” deception, there were two fairly overt masturbation gags in reference to June’s granddaughter? I’ve seen enough Pawn Stars to know Lawrence could have gotten Neal to meet him in the middle at 15 percent of the $60 million. I liked Jones’ involvement in this episode and particularly dug the lingering shot from Peter’s perspective where Jones was visible in the foreground as Neal talked to Mozzie about their plan, which established Jones as Neal’s shadow for the remainder of the episode. I did some research, and the reference for Neal ‘s dopplegangers-in-the-park fakeout on Jones was Rene Margritte's "Son of Man" painting (aka the dude with the bowler hat and apple obscuring his face). If you already knew that, then you are vastly more cultured than I.